One of the hardest things about working on a cookbook is having to let go of recipes due to page count. Doughnuts contains over 50 recipes which is probably more than you’ll ever actually make if you are a sane person. But, I apparently, am not all that sane, because during development, I came up with over 70 recipes, far too many for my page count limit. As it turns out, I had to cut an entire chapter: what to do with day old doughnuts. I know, again with the insanity… who has left over doughnuts? It was a small chapter (mostly because it got cut early enough), but contained some of my favorite recipes like this one that turn left over cake doughnuts of any flavor into an entirely new decadent treat. So here’s the reason to let your cake doughnuts go stale. 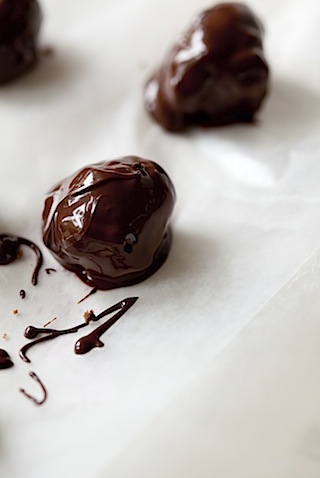 Doughnut Truffles. 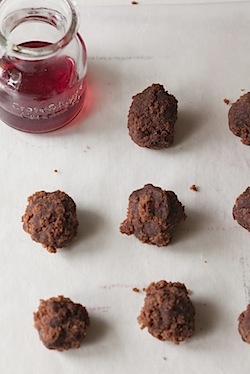 Or, even better, Boozy Doughnut Truffles. Bring these to a potluck, and you’ll turn some heads. First crumble up your cake doughnuts. Don’t worry about getting super fine crumbs. Just break up the big pieces. Add a bit of moisture of your choosing. My choosing was homemade cherry liqueur. You might like Frangelico, Kahlua, Baileys, Grand Marnier, orange juice or espresso. Make sure it isn’t anything too sweet, particularly if your doughnuts are glazed already… you don’t want teeth cracking. 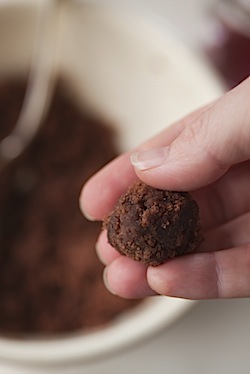 And, just add a little at a time, stir it in, and then see if you can make a little ball that just holds together. Make a bunch of balls. 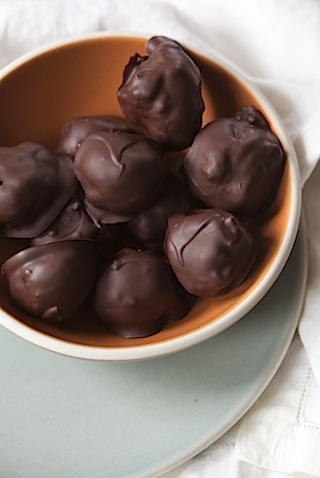 You can chill them in the fridge for about 5 minutes, which will help the chocolate set faster… but it isn’t necessary. 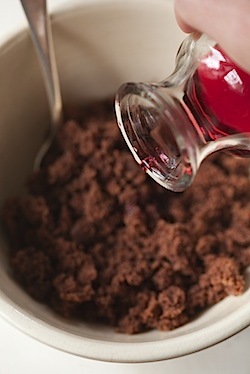 Now, melt some chocolate. I like dark chocolate, but milk or white are great too. Ideally, you’ll temper it, but I didn’t bother. Just make sure you melt enough that you can submerge a whole ball. 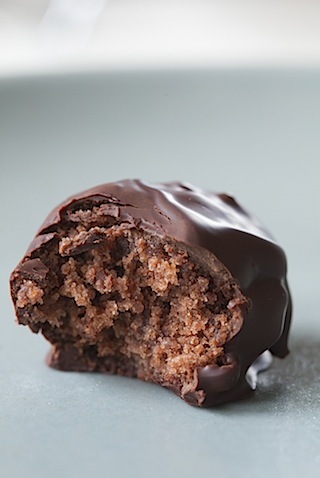 Then, drop a doughnut ball into the chocolate, and using a spoon, coat it completely trying not to move it around too much (or you’ll get crumbs in your chocolate). 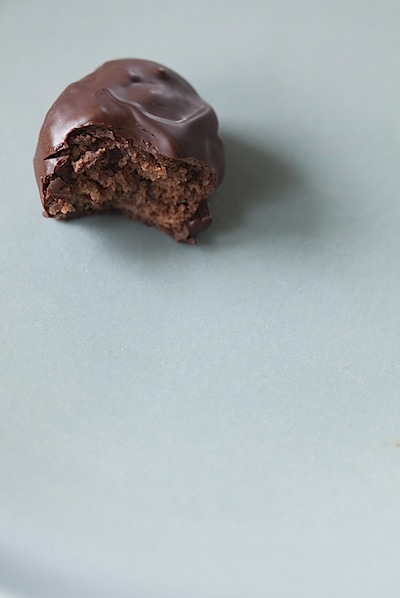 Use the spoon to scoop out the ball, lightly tap to get rid of the excess chocolate, and then roll the truffle onto a sheet of waxed paper to set. Repeat. 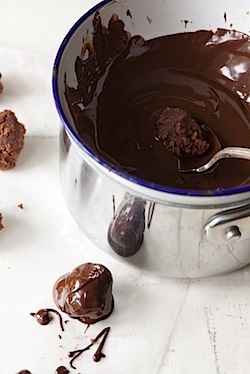 Let the chocolate set completely before touching them… you might want to set them in the fridge for a few minutes to speed this process along. These are equally great with chocolate cake doughnuts, regular cake doughnuts, gluten free cake doughnuts, old fashioned doughnuts, you name it. Just crumble, moisten, dip and set. Then eat. Quickly. Before anyone else sees you. 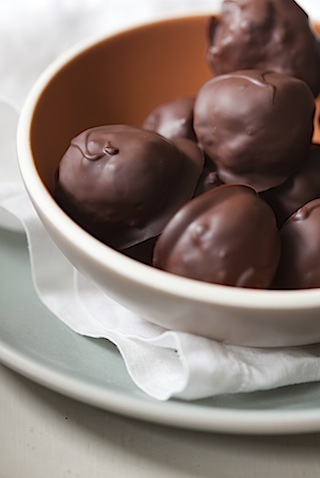 This entry was posted in Cook and Eat, Cookbooks, Desserts, Doughnuts, Food, Recipe, Sweet. Bookmark the permalink. :))) Yeah, right, who has left over doughnuts??? Ah, yes… but it is SO worth it! I have spent a lot of time this year searching for the perfect donut recipe; so I am very excited about your captivating book which I received today. A few pages into it I wanted to know who did the photography – oh, look, it’s YOU! Nice job, all around. Thank you! The book led me here, to your web page/blog, which is lovely too. Just one question before I make my first batch of “Basic Raised” donuts (and I think I’ll start with the chocolate ones)…. 3 Tablespoons of yeast? That’s a lot! 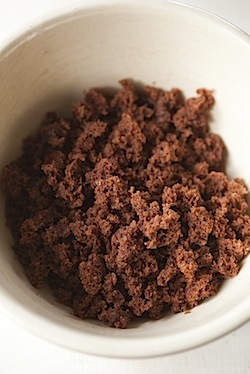 Have you tried the recipe using less yeast, like 2 tablespoons? Please share. Thank you for this book which was sorely needed. Donuts are the new cupcakes. Hi Vici – First of all, thanks for buying a copy and for your kind words on the photos! I hope you enjoy it! For the yeast in the raised dough… yes, it is a lot of yeast (it’s about 2 packages) and the dough is very flavorful with a fairly distinct yeast taste. That’s how my tastes kind of run. However, if they are too yeasty for you, you should be able to cut back on it by probably about 1/2 (1 package). 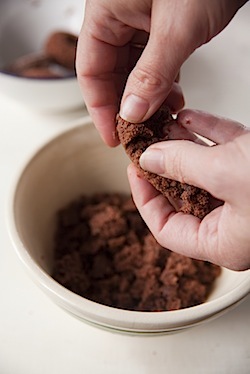 Doing so, of course, you’ll need to adjust the proof times some to get them to be as light and fluffy. I’m saying this without actually having tested them that way yet though… I’m going to be doing a few more test with less yeast/longer proof times and will post about them here… hopefully early next week! That’s what I figured. I’m going to try cutting the yeast in half and expect the dough will take longer to rise – except… I’ll be using the “super-active, bread machine, Rapid Rise” yeast, so perhaps the dough will rise in the same amount of time? I’m glad that you will be exploring this too! OH MY GOSH. Just . . . oh my gosh. Oh. My. I just added these to my “food gifts” bookmark folder. I just bumped into your site and this wonderful little idea…I keep buying Schwartz Brothers baked goods on closeout ‘cuz, um, they are on closeout…and now this idea of yours…oh my gosh, I’m going into the kitchen Now. i am getting this book today. this looks way too good! I have the same problem. No stale doughnuts. I will have to buy extra and age them. Do they have to be old doughnuts? What a beautiful book. I don’t own many one-dessert cookbooks but you have whet my appetite for doughnuts on your blog and I love, love, love this idea. You’ve sold me. I will have to buy your book, Laura. I love cakey doughnuts and the only place I could ever find them in this part of the world was Krispy Kreme and the last time I was there they said they were discontinued. I was so sad. For some reason, everyone is only into raised doughnuts around here. I live in Arizona. Things (cake, brownies, doughnuts, etc.) are stale after 2 days because there is no humidity. This is perfect. Pop these in a cuisinart and pulse and you’re half way there. Thanks!! I FINALLY had leftover doughnuts and made these (made chocolate, banana-bread doughnuts) with grand marnier. I think I’ll have to make extra doughnuts just to make these. These look AMAZING. Sure to cure a major sugar fix!! Can’t wait to try these, Do you share the other recipes from the deleted chapter on what to do with day old doughnuts?